Chris James' research is primarily related to experimental hypersonics. His research interests include expansion tube and shock tunnel test facility design and condition development and the experimental study of planetary entry aerothermodynamics using both optical techniques and physical measurements. Chris graduated from a Mechanical Engineering degree at UQ in 2012. Following this, he completed his PhD and is now working as a Postdoctoral Research Fellow in UQ's Centre for Hypersonics. During his PhD he developed very high speed Uranus and Saturn entry test conditions which were used to perform the fastest experiments which have ever been performed in an expansion tube, as well as developing expansion tube simulation and analysis codes which are now widely used in the Centre for Hypersonics. During his PhD he enrolled in a cotutelle program with École Centrale Paris in Paris, France, and after being awarded an Eiffel Scholarship by the French government, he passed a year on exchange in Paris, France. 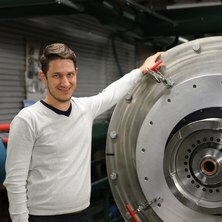 In France, Chris was working on developing the capability to perform radiating simulations to support his experimental work at the University of Queensland. He is currently employed as a researcher at the University of Queensland helping develop the X3R reflected shock tunnel, while also supervising expansion tube research on the X2 expansion tube where he continues to perform research, mainly on using optical techniques such as spectrally filtered imaging to improve test condition characterisation. Cullen, Timothy, James, Christopher, Gollan, Rowan and Morgan, Richard G. (2019). Development of a Total Enthalpy and Reynolds Number Matched Apollo Re-entry Condition in the X2 Expansion Tunnel. In: Akihiro Sasoh, Toshiyuki Aoki and Masahide Katayama, 31st International Symposium on Shock Waves 2: Applications. 31st International Symposium on Shock Waves, Nagoya, Japan, (). 9-14 July 2017. McGilvray, Matthew , Pearce, William and James, Christopher (2016). Non-Helium Secondary Driver. In: 7th International Workshop on Radiation of High Temperature Gases in Atmospheric Entry, Stuttgart, Germany, (). 21-26 November 2016. Parekh, Viha, Gildfind, David, Lewis, Steven and James, Christopher (2015). X3 expansion tube driver gas spectroscopy and temperature measurements. In: AIAA Australian-Asia Regional Student Conference, Canberra, ACT, Australia, (). 23-24 November, 2015. Gildfind, D. E., James, C. M. and Morgan, R. G. (2014). Performance considerations for expansion tube operation with a shock-heated secondary driver. In: Harun Chowdhury and Firoz Alam, The Proceedings of the 19th Australasian Fluid Mechanics Conference. 19th Australasian Fluid Mechanics Conference, Melbourne, VIC, Australia, (1-4). 8-11 December 2014. James, Chris, Gildfind, David, Morgan, Richard G., Jacobs, Peter A. and Zander, Fabian (2013). Designing and simulating high enthalpy expansion tube conditions. In: Proceedings of the 2013 Asia-Pacific International Symposium on Aerospace Technology. APISAT 2013: 2013 Asia-Pacific International Symposium on Aerospace Technology, Takamatsu, Japan, (1-10). 20-22 November 2013. James, C. M. and Morgan, R. M. (2012). Radiation from simulated atmospheric entry into the gas giants. In: P. A. Brandner and B. W. Pearce, Proceedings of the 18th Australasian Fluid Mechanics Conference. 18th Australasian Fluid Mechanics Conference (AFMC), Launceston, Australia, (). 3-7 December 2012.